Talking about interesting wine prices (see my previous post about Larcis Ducasse)... when Château Cantenac Brown 2006 was released on the 4th of June, everyone was in shock. The big question for 2006 was: how much will the price drop. 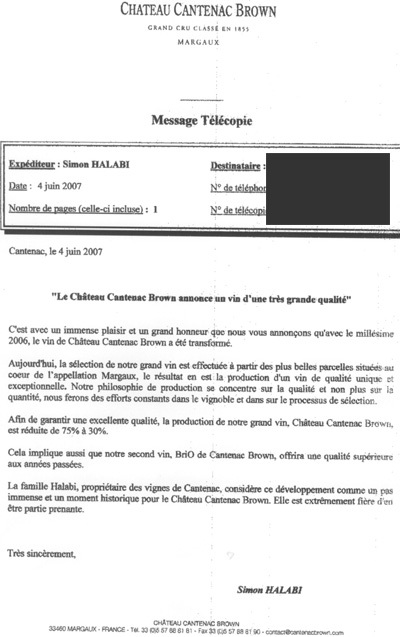 Cantenac Brown decided to turn things around: instead of lowering the price, they doubled(!) the price. Result: the all-inclusive consumer price ended up being around 60 euros (nice graph: 2004 was 20 euros and 2005 30 euros). What was happening here? Well, there is a new owner: the ambitious Syrian-born English billionaire Simon Halabi, who earlier also bought the Mentmore Towers in the UK. Anyone who knows Château Cantenac Brown will see the stylistic resemblance between these two impressive structures. After the improvements by previous owner AXA Millésimes (conducted by the Lynch Bages dream team of Jean-Michel Cazes, Daniel Llose and Christian Seely), Halabi sees an even bigger future ahead for this Margaux Cru Classé. Most interesting here is the letter that Halabi wrote to the Bordeaux wine trade (the négociants); the original in French is printed below. Right after the release many négociants decided to boycott the wine for its surprising price policy. Investments are made everywhere in this prosperous region, and a château can not expect that these are paid back within one single vintage. But there was some demand however, and some traders just acquired the amount of bottles that were ordered. I guess no trader has decided to build up stocks of this wine. Last April I tasted the wine myself. It's a modern wine, quite oaky, and a bit extracted. Not the typical refinement of a Margaux (my rating: 7/10, see Bordoverview, also for all other ratings). But this is an early judgement for a very young wine, and I'm looking forward to retaste the wine after it has grown up. If I can afford it. It will be interesting to see how things develop in view of the recent developments in the UK. Who knows- maybe the property will be back on the market again?